Researchers from China’s Nanjing University of Aeronautics and Astronautics have been studying graphyne, an allotrope of graphene for desalination applications. They say graphyne is a promising material for this application because it enables high throughput and complete rejection of ions and pollutants. It still requires osmotic pressure though but its energy requirements will be lower than current technologies. 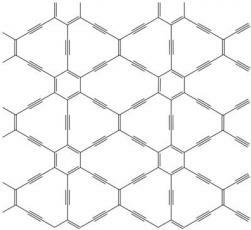 Graphyne is a 2D carbon sheet in which the atoms are connected in a different structure than graphene (some double bonds are replaced with triple bond acetylenic linkages). Graphyne has many nanopores between the atoms that are large enough for water molecules to pass through, but not salt. This means that there's no need to perforate it like is required with graphene and so the researchers theorize that graphyne is more suitable for this application than graphene is. This is all theoretical work (the researchers used molecular dynamics (MD) simulations and first principles modeling) as graphyne sheets haven't been synthesized yet. Using graphene, however, to build membranes for water treatment seems to be a very promising field. Lockheed Martin developed a new energy-efficient graphene-based water desalination technology and are looking to commercialize this technology by 2014-2015. Recently a new start up has been formed at the University of Texas in El Paso (UTEP) - to commercialize graphene membrane based water recycling technology, and in May 2013 Firmus SAM said they expert to deploy graphene's potential in desalination, water treatment and contaminant removal. We've seen related research from MIT and the ORNL, University of Colorado Boulder, UT Dallas and others.